Superhot is a truly fantastic, mind-boggling, time-altering and challenging puzzle game, that really takes you out the real world and allows you to be the action hero that you always wanted to be. The game was already an incredible success on multiple platforms, but having now moved into virtual reality, you really do feel like a part of the game. Punch, shoot and smash your way through enemies in a series of innovative and puzzling levels, that will truly test every fibre of your wits and reflexes. Dodge bullets matrix style – check! Cut bullets in mid-air with only a knife – check! Take an enemy out with a hole punch – double check! Players are truly spoilt for choice. Boasting an enthralling campaign mode that puts you in interesting and somewhat surreal situations, from back alley brawls to construction site melees, the variety is fantastic. As there is no one way to complete a stage, the level select feature that’s unlocked upon completion of the game, gives Superhot a high replay factor. Not to mention the addictive endless waves mode, that requires you to utilise all the skills you’ve mastered from the campaign and test them to the limit, in this unrelenting, high octane survival scrap. All of this is tied together with a stylish and surreal aesthetic that will leave you simply mesmerised. 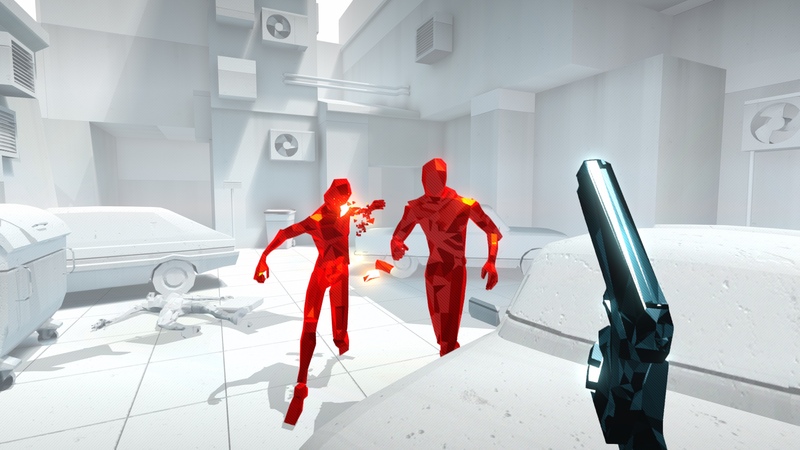 Superhot is a totally immersive experience that fully utilizes the full power of VR and its technology, paving the way by setting the bar high for future titles to come.